In the context of the UN and global governance, 2015 was truly ‘a year of reviews’. 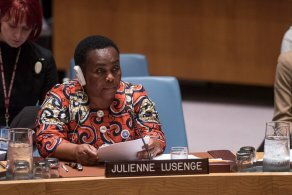 The Global Study on the implementation of UN Security Council Resolution 1325 on Women, Peace and Security (UNSCR 1325) was one of three major peace and security reviews completed last year, the other two being the reviews on UN peace operations and UN peacebuilding architecture. This policy brief summarizes some of the main findings and recommendations of the Global Study, and points to some key areas of concern regarding the next phase of the Women, Peace and Security (WPS) Agenda. A comprehensive normative framework on Women, Peace and Security (WPS) has been adopted. Yet, the implementation of UNSCR 1325 is insufficient. Civil society actors are disappointed at the international community’s lack of will and ability to take concrete action, particularly in addressing sexual violence in conflict. Little progress has been made on increasing women’s participation in formal peace processes. The WPS agenda is notoriously underfunded. To remedy the situation a minimum of 15% of all peace and security programming should be earmarked for women and gender equality projects. The rise of violent extremism and its threats to women’s lives has emerged as a new component of the WPS agenda. Read more in a recent policy brief from the PRIO Centre on Gender, Peace and Security.